The 2019 CFM Handbook contains administrative information about our Meeting, including our organizational structure, the responsibilities of the officers and committees, information about membership and marriage within the Meeting, our use of clearness committees, and various policies and forms. 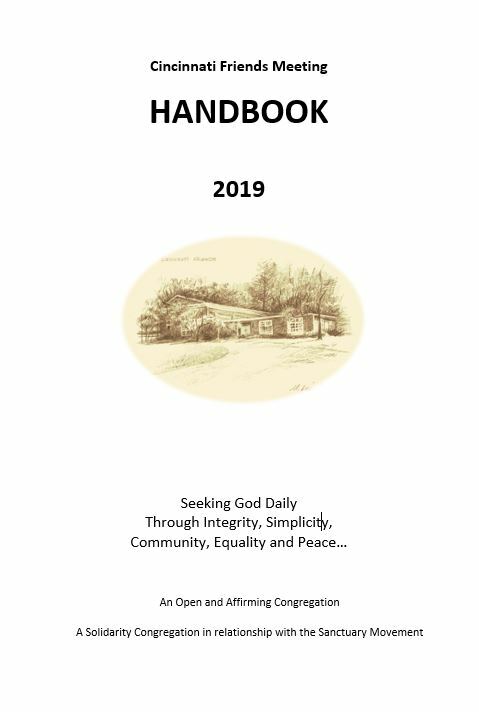 A limited number of printed copies of the handbook are available at the meetinghouse. A reference copy is also available in the library. Updates to this handbook must be approved at Meeting for Worship with Attention to Business, and the online version may be more up-to-date than previously printed versions. In the early years of Quakerism, one of the responsibilities of the yearly meeting was to find out how the various monthly meetings were faring, and which needed spiritual or financial assistance due to persecution. In order to provide the yearly meeting with that information, each monthly meeting would provide an annual State of Society Report. Nowadays, Wilmington Yearly Meeting sends its constituent monthly meetings a set of queries, and the clerk of Ministry and Counsel prepares a report in response to those queries. To help draft that report, in January each committee within Cincinnati Friends Meeting should submit a summary of its activities and accomplishments for the past year. After the draft report is approved by Ministry and Counsel, it is brought to the February Meeting for Business for discussion and approval. Once approved, the report is sent to the Wilmington Yearly Meeting office. 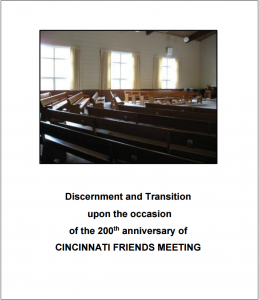 In 2015, to better understand who we are as a faith community and how we wanted to continue to grow, Cincinnati Friends Meeting undertook a lengthy discernment process that welcomed input from all members and attenders. Ministry and Counsel developed a series of queries that were discussed during our Centering Down sessions prior to worship, and input was also solicited through other venues. By the time this process was completed, we had accumulated more than 60 pages of typed notes. This information was summarized into our Discernment and Transition document.